We’ve estimated that the group as a whole has covered over 2,000 miles just in the past 8 months! A sizable portion of that falls on us training for the upcoming marathon, but the rest is spread among half a dozen others who join us for a few miles whenever schedules allow. 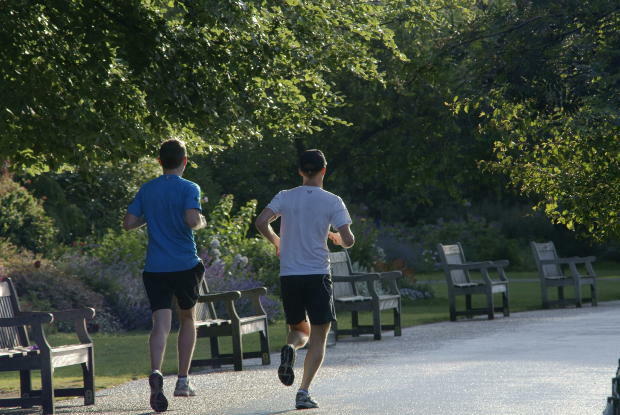 The average runner burns 100 calories per mile, so that pushes the group total calories burned to 200,000! In order for a person to drop a pound, they’d need to cut approximately 3,500 calories from their diet over time. Using those numbers, the group has burned enough calories to shed just over 57 pounds. While the physical health appeals to me, I actually run for the mental benefits. It is a great stress reliever (though it’s less fun to run with me when stress is high due to the crazy pace! ), and it helps me to cope with a demanding schedule. It might sound counterintuitive, but I actually have more energy due to exercising, not less. 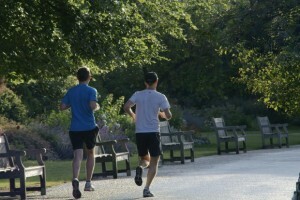 If I was reading this, I’d want to know, “What about the people who aren’t running freaks? Are they getting anything out of this?” And the answer is definitely “yes.” Our superstar admin at work keeps our little kitchen stocked with goodies, but she also started putting some fruit in the mix to help us make healthier eating choices. I often get opportunities to talk about the benefits of exercise to my coworkers, and I (gently) invite others out even if it’s just to walk on the course with us for a little while. On the run today, we are going to have two people join us who I never would have imagined running with the team. They might not be going far or long, but we’re excited that they are taking the small steps necessary toward better health. It’s not official. It wasn’t planned. But it’s had a lasting impact far beyond what I would have guessed. Time will only tell where it goes from here (though we definitely need to do the donut run again this year…)! Great story Ben. The components of wellness programs that I’ve seen work are those built upon the social fabric in an organization. Incentives in health plans may push some short-term changes, but those things that are adopted by the people in an organization can be lasting. Good luck on your marathon.